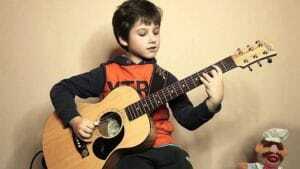 There is no such thing as the right age to start playing a musical instrument. 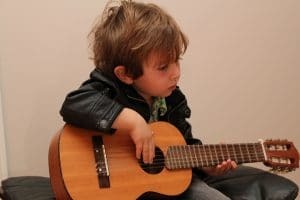 If you want to introduce your kids to the joy of expressing themselves through music, then the best way to do it would be through buying them a guitar as a present. It’s easy to say why this instrument would be the best choice for a beginner. First of all, it’s relatively easy to practice at home, and most folks will tell you that skills can be acquired even without the help of a professional. The internet is filled with tips on how to improve your sound and it also makes available plenty of music tabs for countless songs. It’s easy to replicate any of your favorite tunes and transfer them onto a guitar, not to mention all the genres that you can try. Also, it’s a lot more affordable than buying a piano for example, as it takes far little knowledge on the topic. The thing that you need to focus on now is choosing the right alternative for your little one, since there are a lot of models out there, and it can be quite overwhelming if you have no experience in the field. Luckily, we’re here to help with this comprehensive guide on picking out beginner guitars for your kids. Perhaps this is not the first thought that comes to mind, but you should know there are many types of guitars that you can choose from, apart from acoustic and electric. 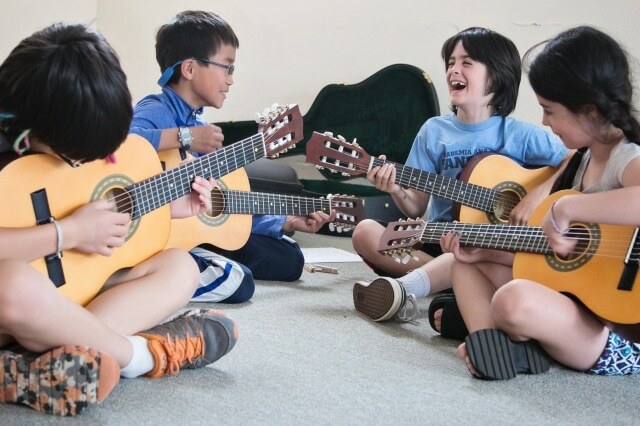 For example, your junior might prefer a mandolin or a ukulele, since they are better fitted for child size and the sound they make is more playful. Choosing between acoustic and electric is the biggest challenge because each of them comes with benefits and particular features. Perhaps this would be your go-to option because mostly everybody starts by learning to play on acoustic guitar, and then moves on to an electric one. It, of course, depends on the genre of music that the kids are attracted to and interested in playing, but if your child is too young to have a developed taste, this is where you come in and shape it. A first pro argument would be that acoustic guitars are more versatile and more affordable than electric ones. A wide range of genres can be accessed through this instrument, from classic folk to blues. This would be a good choice if you’re not sure about your child’s inclinations and you expect them to give up this hobby quite fast. In this way, at least you didn’t put in a significant investment only to find out it was an unsuccessful attempt. However, there are a few details that might pose specific problems for beginners, such as the fact that the strings for an acoustic guitar require higher action, which might result in finger pain and might discourage them from practicing altogether. Skill will come with time, and if they are resilient, the results won’t be unsatisfactory. If you want them to have a less painful road to getting acquainted with the new instrument, you can always choose nylon strings, which are a lot more flexible and less painful for the little musician. Their primary benefit is that electric guitars are relatively more comfortable to play than acoustic guitars. That is primarily due to the height between the strings and the fingerboard, which is significantly lower and thus requires less action and a lot less pain. Even so, until they start practicing on a daily basis and get through the calloused state, this might still seem like a tedious task. This instrument is associated with rock music, and for the little fans out there it might be a great way to impersonate their favorite idols. It’s a much more significant investment on the parent’s part, but there are undoubtedly a handful of pros about buying an electric guitar. Now, most of you may not know this, but guitars come in various sizes, and each fits a particular age group. This means that for children aged from four to six years you should choose a 30” alternative, a 34” goes for ages between six and nine, and a 36” would be the right option for those between nine and twelve years. For any person above twelve years, the standard guitar size should be more than fine. We again suggest that you consider other smaller alternatives such as ukuleles for smaller children since they might have more of an appeal. We’ve previously mentioned that practicing to play the guitar can sometimes be quite painful. Well, the best way to counter that feeling is with the joy of being able to play an instrument that you love. Looks may not be as important for parents as they are for the child, but try to imagine the rock star inside them coming to the surface, and you’ll see why the design of the instrument is so important. Because so few of us get to experience fame in real life, it’s fun to play pretend just for a moment, and it’s always better to do it when your guitar looks just like the one that your favorite idol was using in his latest concert. Last but not least, a good way of choosing instruments is scouting for brand names that are popular among musicians. If you can’t determine the quality of a guitar just by reading a product description, it’s always better to trust the voice of the many and choose a famous manufacturer. A few obvious examples will be Ibanez, Squire or Schecter if you’re looking for more affordable alternatives. Some high-end producers such as Aristides instruments cost way too much money for a rookie guitar player. Also, don’t forget that if they pick up this hobby, you’re going to have to stock up on accessories. A few ideas include an acoustic guitar loop pedal, a capo or an instrument cleaner.